I came into hospital two months ago with acute myelomonocytic leukaemia. I decided to spend £99 on having my DNA analysed to determine my ethnic origins as a present to myself for my 67th birthday, and the results arrived last night. I set to making sense of them, and working out how the results fit with what I already know of my ancestry from my researches over the years. First of all, this is unique to me, and it is an indicator of some of the places where I had ancestors, not all of them. The way genetics works means that each parent passes on a random half of their own genes to each of their children, so my results will be different to each of my siblings, if they choose to be tested. Thus, even though I am half British (my father's great grandparents were mostly English, plus Northern Irish, Scottish and Welsh), my ethnicity is not 50% from Great Britain, as you would expect, but only 16%. A much bigger proportion of my genetic ethnicity is from Western Europe, ie France and Germany, which at 30% is quite a surprise. I surmise that reflects some of my father's distant ancestors. Similarly the 3% from Scandinavia I suspect is a reflection of my ancestry in the North of England. The 1% Irish is a surprise: I might have expected 6% from my Ulsterman great great grandfather William Neill, but his genes didn't reach me. The 1% from Finland is a very curious discovery, and I don't think I'll ever fathom that one. Of course I have Jewish ancestry, and initially the 14% for European Jewish ancestry looks rather low, but that is a measure of my Ashkenazi ancestry I should think, the Schiff ancestors from Mannheim in the eighteenth century, who changed their surname from Schwalbach. The 12% Italy/Greece is almost certainly my Italian Jewish ancestry, the Finzi, Cohen and Castelbolognesi families, for example. I do not have actual Italian ancestry as such, and the results do not distinguish between Italian and Italian Jewish. The 6% from the Iberian peninsula I think must be from my great great grandmother Emma Teglio of Modena. The Teglio family were Sephardim, originally called Tellio, who left Spain in 1492 with the expulsion, and maintained their Sephardi identity in Italy till a hundred years ago. 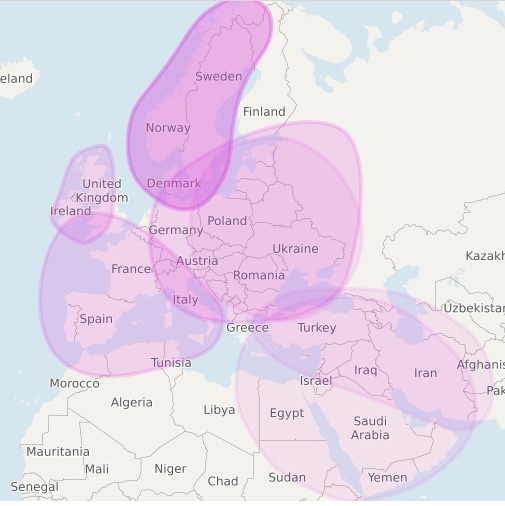 I suspect stongly that my surprisingly large 4% from the Middle East represents ancestors from the Levant, modern day Israel and Lebanon, who married Sephardim. The same is true of the small trace of ancestry from the Caucasus, modern day Turkey and Iran: Jewish ancestry from these places, and the similarly small amount of ancestry I have from North Africa, which I associate again with my Sephardi ancestry. But the truth is that these traces in fact represent my original Jewish ancestry, Jews who came to Italy and thence to Spain and Northern Europe after the destruction of the Temple in 70AD. I also have 11% of my genes representing ancestry in Eastern Europe, and it is possible that is partly from my Ashkenazi ancestors, but also from my grandmother, who although she identified as Italian had a mother who was Slav, and a grandmother named Buzik, which appears to have its origins in what is now the Czech Republic. I wonder how much Italian blood she actually had in her, if any. I recently read the book 'The Orpheus Clock' by Simon Goodman, where in the final pages he mentions the phenomenon of psychogenealogy: 'A French psychologist coined the term psychogenealogy, or “ancestor syndrome”—where some of us are links in an unconscious chain through the generations.' I calculate that roughly 50% of my genetic makeup comes from my Jewish ancestors, a remarkably high figure given my actual parentage. I cannot help surmising that it is a factor in my identifying as Jewish in my life, even though this detailed knowledge was unknown to me for a long time. As my siblings have the same ancestry as myself, but different genetic inheritances, their ethnicity estimates would and should be very different to mine. Blood may be thicker than water but genes tell a different story. I resubmitted these DNA results to the website MyHeritage and they reinterpreted them to get the same but very differently emphasised conclusions. Now my Western European is Scandinavian, which I interpret as being my Y chromosome, my paternal ancestors from Staffordshire, which makes sense. The Irish, Scottish and Welsh, also makes sense, though these are all bunched together. Iberian is surprising. I know I have Sephardi blood, but does Iberian include Italian? The map suggests it does, and even French is included. Ashkenazi Jewish is surprisingly high, but I'm not complaining. East European also seems about right. My good old Middle Eastern ancestry shows again, reflecting my ancient Jewish heritage, as does the West Asian from Iran and the Caucasus, or is this a relic of the Babylonian Exile? I recently had myself and my wife tested on 23andme and received their results, which give just a teeny bit more information. Your maternal haplogroup, HV6, traces back to a woman who lived approximately 5,500 years ago. That's nearly 220 generations ago! What happened between then and now? As researchers and citizen scientists discover more about your haplogroup, new details may be added to the story of your maternal line. HV6 is relatively uncommon among 23andMe customers. Today, you share your haplogroup with all the maternal-line descendants of the common ancestor of HV6, including other 23andMe customers. Haplogroup HV is a part of the rich history of the Middle East. Haplogroup HV is often found in the Middle East, an area that has played a pivotal role in human evolution. It served as both a passage for humans leaving Africa for Asia, and as the cradle of agriculture in the west — one of the most pivotal innovations in human history. The Middle East has also been a part of several different empires, conquests, and invasions, leaving it a genetically complex region. Frank, your paternal haplogroup is R-L48. Your paternal haplogroup, R-L48, traces back to a man who lived less than 10,000 years ago. That's nearly 400 generations ago! What happened between then and now? As researchers and citizen scientists discover more about your haplogroup, new details may be added to the story of your paternal line. R-L48 is relatively common among 23andMe customers. Today, you share your haplogroup with all the men who are paternal-line descendants of the common ancestor of R-L48, including other 23andMe customers.